Why not take the Baroque Schwarzenberg Garden and transform it into a Swimming Bath? Instead of destroying the Gesamtkunstwerk of the Garden with buildings like a commercial brewery there could be invented more intelligent and poetic programs, which fit better to the World Heritage. The old big baroque Water Basins could be filled with water again and would enable to create a UNIQUE SWIMMING BATH! This extraordinary Swimming Bath Area would be situated in the City Center of Vienna next to the Belvedere Palace. Therefore, the 300 years old Schwarzenberg Garden, designed by Austria's most famous baroque architects, Lucas von Hildebrandt and Fischer von Erlach, could become a real pleasure place in summer with a possibility for a cool water dive for the inhabitants of Vienna. This is a contribution to the World Heritage Report of the UNESCO from March 2019, which asks to RE - THINK the current projects under construction and the use for this park and World Heritage Area. 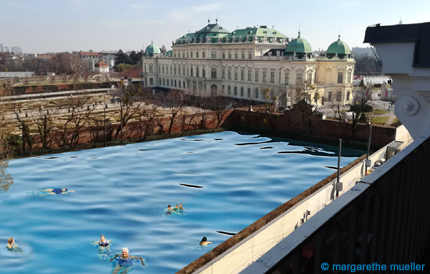 The proposal of a unique Swimming Bath within the baroque Gesamtkunstwerk responds to the global warming of our planet, which also will heavily effect the City of Vienna and its inhabitants. We will all be happy to COOL our poor bodies in the forthcoming heat! Please remind: Human bodies are limited in heat. Beyond 42 degrees Celsius it will be difficult to survive! In addition, the proposal responds to the intention of creating a better micro-climate within the City of Vienna in times of global warming. We need all recources we have. Why not reactivate the old water basins? The basins are already there! This is a cheap and affordable design strategy and should be seen as a counter-proposal to the heavy building activities, which currently destroy the World Heritage site. I prefer not to. Sometimes it is better not to build but look what is already there! 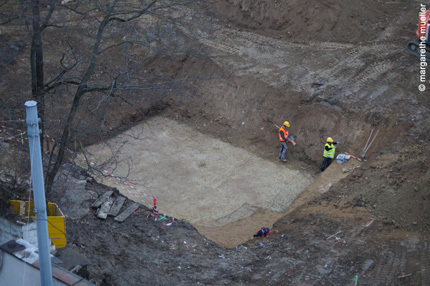 On the Salmbräu-Belvedere Stöckl construction site within Schwarzenberg Garden they have found today the hidden Baroque Water Bassin from about 1731 from Fischer von Erlach and Johann Lucas von Hildebrandt. We always said the Bassin on terrace level 3 of the park might be there under ground, nobody believed us, now they have found it! What you see is only a small part of the water bassin, the rest is still waiting to be discovered. On the right side: the baroque bassin wall. 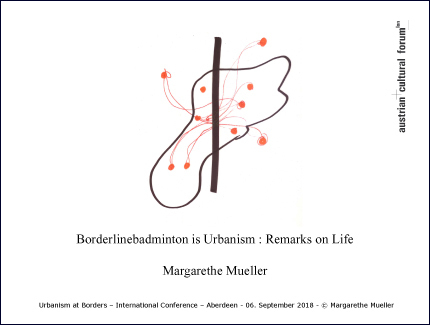 This brings hope to the fact that Schwarzenberg Garden and the Baroque Water Basins will not be distroyed, but kept as a "green zone" of high architectural quality and as unique Urban Heritage in the middle of the city of Vienna, connecting the First District with the new area around Hauptbahnhof.